An entry-level 29er that feels more advanced, the Nucleus is the model that all other Vitus rides take their attitude and high-standards from. MBR award-winning for its performance and price for three years running, it is a big and bold gateway bike. The Nucleus 29 VR benefits from a quality construction which features low, long and slack geometry for making the most of climbs, descents and sprints through varied trails and terrains. Kitted out with hard-working components, it lets you ride with confidence and aggression, no matter what your route throws at you. The 100mm travel SunTour front forks absorb every impact on your run as you are pushed on by a superb Shimano Altus 2x9 drivetrain. Keeping you in control are powerful Tektro hydraulic brakes and the frame is designed to feature dropper post routing for future upgrade potential. 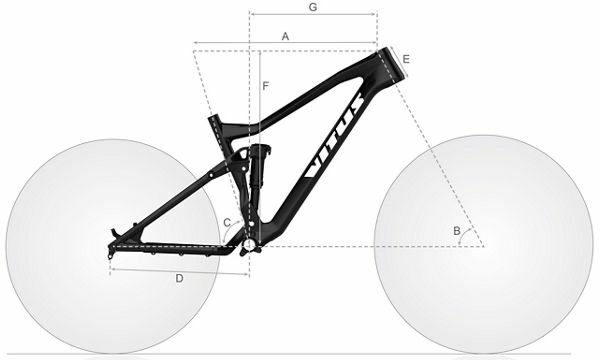 An excellent addition to the foundation range of Vitus' MTB offerings, trail-ready hardtail will take your riding to new heights. Vitus Nucleus 29 VR Mountain Bike (2019) is rated 5.0 out of 5 by 3. Rated 5 out of 5 by Ferte63 from Great bike for the money Fast delivery, great bike för the Money, higly recomended. Rated 5 out of 5 by Ashos from Pretty Good A subjective review... I am mostly a roadie (Genesis Equilibrium and custom Ti). Used to MTB as a kid on 26" bikes. I commute all the time on my venerable Ridgeback Day 01. I used to live in London, now Stockholm. I'm a guy, 180cm. I wanted a new do-it all MTB. Mostly to do a long-version commute, via some tracks etc. And to handle the poor Stockholm winter weather. And to train on when there may be ice around and too dodgy for the road bike. I hunted around a lot online and settled for this. I hadn't any 27.5 or 29 experience other than a few test rides. I didn't want to spend more than £500 but wanted the best ride I could find. This seemed way better value than what I could find locally. And free delivery to EU! Despite now being in a **** of trying to find a rack to fit this bike, I am pleased I went with a 29 in L. It rolls well but is sluggish to accelerate and has less torque. It doesn't flick around corners on tiny woodland trails or really narrow streets like a lighter road bike or a 26" MTB but it does flow over potholes etc like a boss and can get up to good speed. If anything the bikes length seems slightly short so I am very very pleased I went for L over M (from my mostly road biking viewpoint). I may get a 7-10cm stem to help with reach. The frame is good and geometry fun. I enjoy riding this. The BB is low-ish which is a bit of surprise off road for me, as the pedals can strike rocks and roots etc. But then the CG is nice and I can take my hands off the bars more easily than on any other bike = great stability. The fork has a ? over it. It's called "Air" but is coil. I think. I am yet to get to the bottom of this. Totally ridiculous nomenclature if that's the case. It's fine though and I appreciate the lock-off. Brakes were a world of pain to start with (Wiggle set it up the wrong way around, then a local bike store messed up the swap and I had mineral oil pumping out while on a ride - but that's all rectified now). In a way I wish these were mechanical disc. The rotors have some surface rust on them after 1 month of winter rides - surprising. While I mention rust, the odd component has surfce corrosion already. Stockholm do chuck a lot of salt at the roads though. The chain went orange within a few days so the factory oil is pretty poor. The shimano stuff is as per and fine. The gears are slightly clunky. One note is that the front shifter has 1-3 written on it where there are only 2 gears. Poor choice of kit I say but then I have only noticed this once. The frame is good. Seems well made. I would always prefer Ti or steel but this is alright I guess. Paint is very nice and glossy, but rather thin - it's chipped already. Tyres are decent. Roll ok on the road too. Pumped to 50psi the have a rubbery bounce to them, a sort of rebound, that is characterful. Ie if you ride into a kerb the tyres give a rubbery rebound rather than an absorb. And then you notice this character while rolling. Taking the tyres off to pop on spiked tyres - wow: I've never had the pleasure of removing tyres from a tubeless rim before. They were nearly welded on! And then putting new rubber on involves 60psi+ and soapy water and then riding over kerbs. My idea of easily swapping out tyres based on +/- weather is now gone. n+1.... Finishing kit is fine for the price. Saddle's quite ok. The bars seem stupidly wide, unless you are bombing down a mountain. I will hacksaw 10cm off them. And the grips bizarrely slim. It's my own fault in not buying a sensible tourer or a MTB with eyelets but attaching a rear rack to this is almost impossible and finding sizing info on racks is a hellish task. I now have a solution though!... a pair of Bontrager axle brackets, a Topeak Uni Tourer for 29" and then another set of Topeak Arms for this to extend the rack beyond 375cm which are bolted upside down to make a pair of double arms and then a saddle clamp with eyelets. Phew! Given the price and the free EU postage I think this is a great bike. Rated 5 out of 5 by Paul34958 from Perfect bike, just one issue I really love this bike, it feels great to ride and looks awesome. My order arrived earlier than expected, it was perfectly packaged and customised for my height. I would give it 10/10 but for some reason the handlebars are comically oversized, so they need replacing. The handlebars are almost a foot longer than on my previous bike. No idea why they are so long but that's my only issue. 9.5/10 would definitely recommend. What is included with the &quot;complementary bike tools&quot;? I am especially asking, if I need a shock pump or it is included. But it would be nice to know, what tools are included in the kit. Thank you for your support! We can confirm a shock pump will not be supplied. This will be need to purchased separately. The complementary bike tools will come with a pedal spanner and multi tool kit. I&rsquo;m 6&rsquo;2&rdquo; which frame should I go for? I previously owned a Kona Blast 20&rdquo; hardtail and found that perfectly fine, and I currently own a Bombtrack Arise (Large) Going from the size suggestions I fit into the. 5&rsquo;11&rdquo;-6&rsquo;2&rdquo; category but I do prefer a slightly longer reach ( maybe my arms are longer!?) would the extra inch make that much difference?